RBC was looking to penetrate the highly allusive student demo. They knew that if students didn’t bank with RBC now, they would never become RBC customers in the future. The core objective was net new client acquisition. We leveraged high traffic Orientation Festivals reaching the student masses. 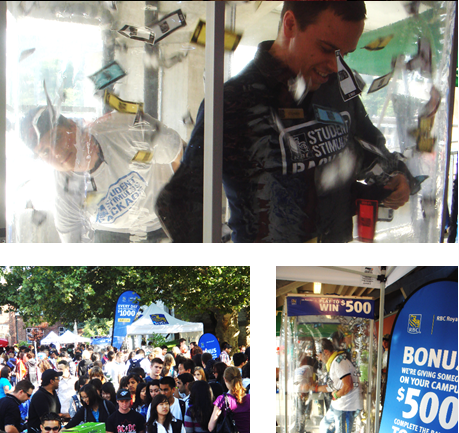 To capture students’ attention, we developed a cash cube activation where students entered an enclosed cube filled with “RBC cash”. With an industrial blower connected to the cube, students had 15 seconds to collect as much cash as possible to win a $500 pre-paid VISA. In order to participate, students needed to register into RBC’s email database. This data mining effort was critical in converting signs ups to account opens. In the end, we set a record for the highest number of net new client acquisitions during the month of September, and far exceeded targets!